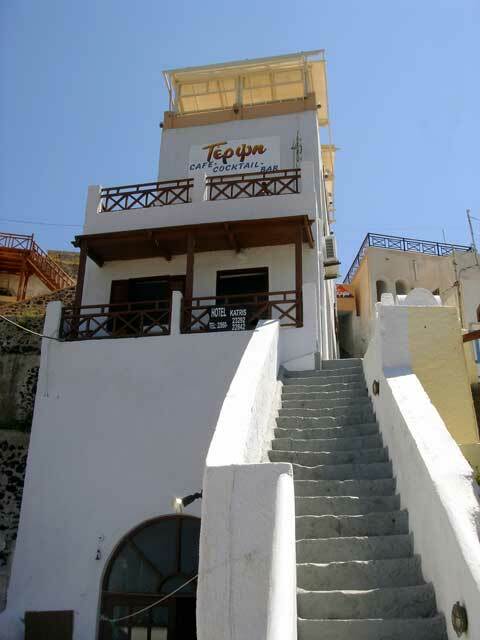 The traditional hotel KATRIS is located in the beautiful capital of Fira. It provides all visitors a comfortable stay in a friendly and family surrounding. It is one of the oldest hotel units in the town, operating since 1972. The hotel is built in a privileged location, just 150m from the central square of Fira, which makes access to the shopping center easier. All coffee houses, restaurants and nightclubs are very close to it. And not only that. The island’s museums are only 50m from the hotel, while 100m away is the famous railway, which will take you to Yalos (Old Port) in order to take the boat to the Volcano and Thirasia. Katris is built according to the traditional architecture of Cyclades islands. 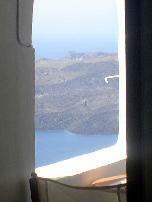 The two storey, white building, with wooden shutters and rails is typical of the island. 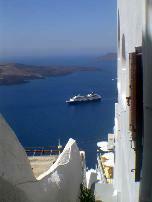 The air of Cyclades and the magnificent view to the Caldera rim will leave you with the best memories from your holidays in Santorini and the stay in KATRIS hotel. Hotel Katris has 5 rooms (double and triple). The external view and the interior are decorated harmoniously with traditional colours. All rooms are spacious and equipped with air-condition, bathroom, fridge and private balcony with magnificent view to the Caldera. Visitor can enjoy their coffee or a drink in the cafeteria inside the hotel. Café – cocktail bar TERPSI gives the opportunity to relax enjoying the unique beauty of Fira Town. Breakfast is served to the hotel guests with extra charge. Είστε ιδιοκτήτης ή διευθυντής στο KATRIS; Εγγραφείτε τώρα για δωρεάν εργαλεία, που μπορείτε να χρησιμοποιήσετε για να βελτιώσετε την καταχώρησή σας και να συνδέσετε την ιστοσελίδα σας και το σύστημα κρατήσεών σας.